There have been some pretty incredibly great things this week, so it is a little hard to think back to the previous one. Thankfully, I took some notes and can share a few of the good things that happened last week. Outpouring of love for David Carr – David Carr was a journalist who worked for the New York Times. Last week, he died suddenly after collapsing in the newsroom. I read David Carr’s work in the Times and had seen him on television. He wrote thoughtfully and insightfully about media and society. His background included a period of his life where addictions controlled it. He wrote about that period and his rise from it. What came out after his death was stories of the person David Carr, and how he gave so much to those around him. He did not forget friends. He helped other writers. He was a great father and husband. Each piece written about him seemed to reflect on the gift it was to have David Carr as part of your life. Journalism can seem like a pretty rough business with plenty of ego. It was touching to get to understand what David Carr meant to so many. Items in my closet – Since the beginning of the year, Dan and I have been trying to eat more Paleo and move more. It has been a good program for us and we are both seeing positive results from it. Last week, I was able to pull a few things out of my closet that I had 86ed because they were wickedly too small. I wore my jeans that a few weeks ago I would only wear when I wanted to torment myself, and I wore a dress that I bought quite a bit ago but never wore because it was too small. I still have miles to go, but small victories are incentive to continue on the journey. Good wisdom – There were a few things going on last wee that required me to seek assistance from others. When you have people in your life who you know will listen and understand and support, you are a lucky person. I am a lucky person in that way. The person that I turned to last week has a characteristic that I would call rational empathy. She sees things as they are. She won’t sugar coat things or skirt the reality. She is there and present when needed. As we worked through the situation, she said something that sticks with me and think always will. She said that our calling is to show up for our fellow humans. I’ll go with that. Mashed Cauliflower – With this diet we are on, there are all sorts of hacks to replicate things you shouldn’t have. There are some misses. Spaghetti squash in no way, shape, or form reminds me of pasta. One that I tried that did work last week was mashed cauliflower. Goodness it was tasty. I want to eat it every day. It is super simple too. Meeting Stella – Our friends John and Tracy have a new puppy and we got to meet her last week. She is an itsy bitsy darling jolt of energy (notice the blurred tail in this photo). Watching her run around and discover was very fun! Here’s hoping that your days each hold good things that you add to your own list. Holiday weekends bring free time to catch up on things that didn’t get done in the lead up to said holiday. This is a little outdated, but what can be wrong with reflecting on good things that came my way in the recent past? The Morning Fox – Nope. This does not refer to anything that has to do with the Fox network. What happened is that I stepped out my front door last week at about 5 AM. It was dark and cold and still. While I walked down the steps to fetch my papers, a beautiful full-grown fox came running down the middle of my street. It was so swift and pretty. The memory of it still is a thing of beauty. Wildlife in the middle of the city happens. Anne Lamott talk – Anne Lamott was in town last week, talking about her new book, Small Victories: Spotting Improbable Moments of Grace. Hearing her talk was a wonderful thing! I got to know Anne Lamott first via her book Bird by Bird. It is a wonderful book about being a writer, and writing, and life. Hearing her talk is just like reading her words. She exudes a comfort with herself that makes the space comfortable. She speaks off the cuff and with humor and grace. I love the life that the words she writes and she speaks hold. My favorite essay from Bird by Bird is the title one. In it she remembers her brother whining over a school project that he had to do about birds. He could see no way that he could possibly tackle such a project. Her dad gave him the how to lesson that always sticks with me when I have a big project that looks overwhelming in front of me. How can it get done? Bird by bird. Chrissie Hynde at the Uptown – This seems like forever ago, but it was officially last week. Dan won tickets to go see Chrissie Hynde perform at the Uptown. She is on a solo tour, but she is backed up by a super band. While I like the Pretenders, they aren’t among the bands I would put among my all time favorites, so seeing Chrissie was something I looked forward to, but I wasn’t over the moon excited about. Dan and I listened to her new album in our listening blog series this year, so I was ready for those songs. She did lots of those along with several Pretenders songs. I gotta say that I really loved this concert. Chrissie was charming in her banter with the audience and band, and her voice is amazing. I don’t know what it would sound like if you did a side by side of her singing thirty years ago, but I don’t think that she has lost anything. One interesting thing about the concert was a big warning that she did not want cell phone pictures taken during the concert. She explained later that the screens really mess with her eyes and she doesn’t like it. When the last number was about to start, she told people that they could use them. A sea of cell phone rose in the air. It was a fine example of give and take! She also writes charming and sweet Facebook tour updates (photo above from that). Lunch with Friends – Some friends from out-of-town were here visiting other friends last weekend and we got to meet up with them for lunch. We met at BB’s Lawnside BBQ. Man! If you want to hang out on a Saturday afternoon, catch up with friends over a couple good beers and some smokey good meat, BB’s is hard to beat. We have been going there since it first opened in 1990. It has always been a place with good food, friendly staff, and great music. Lucky us! A new tracker App – I have been trying to pay more attention to some lifestyle things and I found an App this week that I think may be an easy, manageable way to do this, and I can 86 my homemade Excel sheet. TrackNShare comes with some items built in for daily tracking – Happiness, stress, weather, sleep. You can then add other things you want to track and decide on what kind of scale you want to track them. For example, you can choose yes/no, severity scale, a number, a volume scale. It is easy and having it on my IPad and IPhone make it convenient to an extent that makes me not have too much of an excuse not to do it. That’s some of my story from last week. This week – one in which thankfulness was the dominant theme – is filling up my pages. Thanks for reading and I hope that your good things are many. I don’t get “stressed-out” very often. In general, I am a low-key person who operates on an even keel. The downside of this is that I can be kind of boring, but it is how I like to be. It is how I am most comfortable. This week, there was one day that I came home from work feeling definitely stressed. The next day felt better, but I am definitely in a high intensity period where there are many things going on and I have lots of responsibilities. But I am working it through; I am counting on my team mates who are wonderful; I am reminding myself of work/life balance; and I am remembering all of the good things. I already have this week’s list going, but here are five things from last week. First hummingbirds – Dan researched the issue and found out that it is the male hummingbird that shows up first. Well, Mr. Hummingbird with a flaming red throat showed up at our feeder last week. I walked out the back door and saw the familiar frantic flight zip by me. I hoped that it was a hummingbird, but figured that it was only a crazy bug trying to fool me. But, it was real. Sitting on the patio reading, I heard the noise and there it was at one of the feeders. They are so pretty and fun to watch. I can’t wait for their wives and girlfriends get here! Dishwashing and Tidying Up – When I do get stressed, tidying up my surroundings is one way that settles me down. Even finishing up and looking at the colorful plates in the dish drying rack holds so much goodness – the order, the color, the memory of the food that filled those plates. Finding new tidbits in my book research – Yes, I am still working on that book. Last week I worked on the chapter focused on Marcia’s family and friends starting a fundraising group only months after leukemia took her life. This is really incredible. This was 1949! This was during a time that moving on was the most common way of dealing with grief. This family, along with their wonderful friends, coalesced and used Marcia’s story to begin to raise money for research to help find a cure for the disease that takes children’s lives. I found evidence of a contact that the family made only month’s after Marcia died. The contact was Sidney Wallach. In the 1930s and 40s, Mr. Wallach worked with Jewish causes in NYC. He led the American Jewish Committee and founded The Current Jewish Record Journal (which later became Commentary). In 1933 he published a pamphlet called “Hitler, Menace to Mankind,” which is pretty chilling. In the 1940s, it appears that he switched career paths and started focussing more on public relations for philanthropic causes. Using the items that I have been entrusted with as well as the amazing Internet, I filled in some more blanks of this great story. There is more to learn, but this was progress. Whitman Illuminated – In December, I forwarded a blogpost to Dan about a new book being put out by fabulous Tin House. That was enough to make him pre-order the book. We had pretty much forgotten about it, so when it arrived last week, it was an incredible treat. It is one of the coolest books I have ever seen. Artist Allen Crawford has taken the words of Whitman’s Song of Myself and illustrated them so incredibly! Every page is stunning. Kristie Stremel and Joe’s Pet Project at The Record Bar – Thanks to friends, we went to The Record Bar on Saturday night to hear music. Joe’s Pet Project was playing when we got there, followed by Kristie Stremel who was backed by a great band. Both of these groups filled the room with fantastic rock and roll. Joe’s Pet Project had a kind of Dave Matthews’ vibe; Kristie is a true blue, girl rock and roller, of the best kind. She leads her band with energy and musical chops. Every musician seemed to be having such a good time making music. More music to add to my list. It was 80 degrees in Kansas City on Saturday. It was a day that I should have had the top down on my car, mowed the grass, planted something, had a drink on the patio, or washed my car. I didn’t do any of those things, but here are some other good things that happened during the week. 1. Union College wins the Division I Hockey Championship – Little Union College in Schenectady, NY is where both Dan and I went to school. It is an idyllic little liberal arts school in the middle of a very working class town. It is known much more for academics than sports. But this week, the Union College Dutchmen (yep, you read that right), plowed past Boston College and the University of Minnesota to be the victor of the Frozen Four. Saturday night, we had friends over and watched the game over cocktails and locally made kielbasa. That’s the way it should be done. 2. Flowering Kansas City – I always think that there is one week in Kansas City that outshines all others as far as showing off its beautiful nature. Maybe there will be better, but it is going to be hard to beat last week for the best. Magnolias, Bradford Pear, Forsythia, Redbuds, daffodils, tulips, hyacinths! Even the dandelions looked bright and cheery. Well done nature! 3. Pattie Mansur wins a school board seat! – I met Pattie when her daughter became a member of my Girl Scout troop. It was such a gift to me to become acquainted with such a caring and fun family. There are always people in your life that you know you can count on. That is the Mansur family. Even though Girl Scout days are long past, I still run into Pattie occasionally. We always eagerly catch up. When she announced that she was running for school board, I was so excited for our city. This week, voters came out and elected a wonderful advocate for all of the children of our city. 4. S. by J.J. Abrams and Doug Dorst – I love to read and I love pretty books. When those two elements are combined, it is more than delightful. This week I finished reading S.. I can’t really adequately describe what an amazing book this is. There is marginalia of several different colors snaking its way around most every page of the book. Tucked inside you will find mass cards, napkins with maps, letters, code solvers … You just don’t know what is next. I must say that I enjoyed the experience of reading the book more than the book itself, but that is not really fair. I know he is J.J. Abrams, but the fact that publishers still gave the okay for this makes me optimistic about the future of book books. 5. 10,000th Blog View – Early this week, someone clicked on my blog for the 10,000th time. That is pretty cool to me. It is not the sign of a hugely successful blog, but it is a sign that many of you read what I write and choose to come back. There are weeks that I don’t feel like posting this or anything. I usually convince myself that my being there is both good for me, and for the people who might read it and recognize good things that they otherwise may not have. Thanks for being part of my second 10,000! Have a good week and be aware of the good things! Do you do that? Judge a book by its cover? I certainly do it, with varying levels of successful outcomes. Like wine bottles, a well designed book cover snatches my attention away from its plainer counterparts. It doesn’t have to be flashy or gaudy. It just has to have a certain something – the font, the photo or illustration, the placement… all working together to represent what lies inside. Whatever it is, some book covers just work better than others. I went to go hear him talk a couple years ago at our local library. He is a good speaker and his description of how he works is inspiring. His TED talk about book design is fantastic. A few weeks ago I heard him interviewed on the Design Matters podcast. He commented that he got so many requests from people wanting advice from him about their work, that he could not possibly answer them all and still get his own work done. Subsequently, he decided that he would offer an on-line class to teach what he knows and thinks about book design. That class is now available, and I am taking it! The content is offered by Skillshare. This is actually a pretty cool deal. There are a multitude of classes that are offered by the site, and I don’t know if any of them cost more than $25 (and there are usually discounts available). The classes come via videos and there is an assignment/project associated with each. You have the ability to create your project on the class site so others can give you feedback. While you don’t lose access to the classes once you purchase them, doing them on the schedule suggested makes the interaction with other participants more timely. Chip Kidd’s class that I am taking is called Introduction to Book Cover Design: Making Stories Visual. The assignment is to redesign a book that we love. This morning I watched the first two videos. In the first, he gave a history of book cover design in about 9 minutes. This is not a survey college course by any means, but it is a friendly, efficient way to get some new learning into your life and get your own creative process activated. That brings me to the book that I have chosen for my assignment. Five Quarts by Bill Hayes is one of my all time favorite reads. Its tagline is “a personal and natural history of blood” – of course I love this book! He blends medical history, personal anecdotes, and contemporary investigation to tell a story about blood. He makes it work really well. There are two editions of this book. I have the white one, but I think I prefer the red one. I don’t dislike either of them, but I don’t know that either is as good as the book deserves. I have serious doubts as to whether I have it in me to design something that will be better than the current choices, but I am eager to delve into this attempt at creativity. If you had an opportunity to change a favorite book’s cover, which one would it be? November arrived in a beautiful fashion here in Kansas City. The fall colors are at their finest. The air is crisp. While there is some melancholy to see the door of warm weather close, these final days of the year will surely have many good things. Along with seeing some very cute costumed children (and animals) this week, here were five of the good things of note as October moved out and November rolled in. Lobster Rolls – Our local grocery store declared October to be Lobster Fest month. All month long, lobster tails sold at bargain prices. Inspired by this celebratory occasion, Dan tried his hand at creating a lobster roll early in the month. As the end of the month came, we had not one, but two lobster rolls this week. He nailed them. For me, the secret of the lobster roll is simplicity. The steamed tail meat is combined with a little mayonnaise, lemon juice, salt and pepper. That is it. The receptacle is a hot dog roll: buttered and toasted. Accompaniment: potato chips. This is a decadent delight! Oh Lobster Fest month, I will miss thee! Cindy’s Upcoming Journey – My friend Cindy grew up in Iowa. She now lives in Southern Missouri. She likes to garden and she adores her beautiful grand-daughter. She knows that she is lucky. Next week, Cindy will travel halfway across the world to help raise awareness about those who do not share her good fortune. The Freedom to Walk website states that “By definition, trafficking involves some element of force, fraud, or coercion. Because of the illicit nature of this crime, estimates of trafficked persons worldwide are difficult to verify, but they range from a few hundred thousand to more than 30 million. Individuals are trafficked for work across industries, including manufacturing, agriculture, fishing, garment production, mining, and domestic work.” Cindy is participating in the DREAM Project Foundation’s walk to stop human trafficking. The walk will last for fifteen days and cover 220 miles across the country of Thailand. Along the way, she will reflect her commitment to make the world better. On Friday, Cindy’s daughter and son-in-law held a gathering so we could wish Cindy well and learn more about her journey. I am so inspired by what she is doing. If you are interested in learning more, or contributing to the cause, you can click here. Wet leaves – Early this week we had several rainy days. The rain and the accompanying wind created a layer of wet leaves across most surfaces. Like temporary tattoos, the leaves stuck to cars creating pretty designs. The road, as I set out to drive to work, looked like it had a multi-colored carpet. While I love the sound of shuffling through dry leaves on an autumn day, this week really made me appreciate the beauty of the sticky wet autumn leaf. Will Sheff’s article about the death of Lou Reed – There were many tributes to Lou Reed this month. The poet singer meant much to many. When I was once asked what my movie theme song would be (i.e. if someone made a movie of your life and the final scene is you walking along the beach, what song should be playing? ), my choice was Perfect Day. I love that song so much! Will Sheff leads the bank Okkervil River – another favorite of mine. Will wrote a tribute to Lou Reed for the website, Gawker. Will has an unconventional voice, that I like, but which has its critics. He looked to Reed as an inspiration, and, it turned out, Reed really liked Sheff’s music and invited him to open one of his concerts. After the concert, Will went into the inner sanctum to meet Lou. Sheff writes, “When my turn came to talk with Lou, he gave me a soft handshake that he held for an uncomfortably long time. Eventually I had to extricate my hand from his. He told me, “You are a great rock singer. You’ve got a great rock voice. You can sing anything.” Everything in my life changed when Lou Reed, my musical hero, said that to me. Everything I’ve had the guts to do as an artist since 2007 came out of that moment. I am a different artist now. It was one of the kindest and most perfect three sentences anyone could have uttered, and coming from Lou Reed its effect was profound. I transformed into something else once he spoke those words to me.” It’s a beautiful piece about listening to and loving music. Billy Lynn’s Long Halftime Walk – I finished Ben Fountain’s great novel, Billy Lynn’s Long Halftime Walk this week. I read somewhere that this book might be this generation’s Catch-22 or Slaughterhouse 5. I can see that. Fountain’s novel describes an extraordinary day in the life of Billy Lynn. Because of war heroism, Billy and his unit are on a hero tour in the US. They are trotted out and interviewed and feted. It is all pretty surreal for the eighteen year old soldier who is still processing and mentally trying to heal. The last day of the tour brings them to a Dallas Cowboys game where they are the guests of honor. At first, the owners gush over them, the crowd cheers them, they get close to cheerleaders and Beyonce. In the end, things fall apart in many ways. It is a thoughtful read that I would very much recommend. Another good thing from this week was October was the third month in a row that the number of visitors to my blog and visits to my blog increased from the month before. I am so thankful for each of you who reads and when you pass it along to someone else, I am really touched. I will never attract the thousands that many blogs do, but knowing that there are readers enjoying what I get down, is pretty great! Thanks everyone! What about you? What was a good thing for you this week? November 1, 2013. Two months left in the year – sixty-one days. The good(?) thing about having a blog is that it can hold the writer accountable. 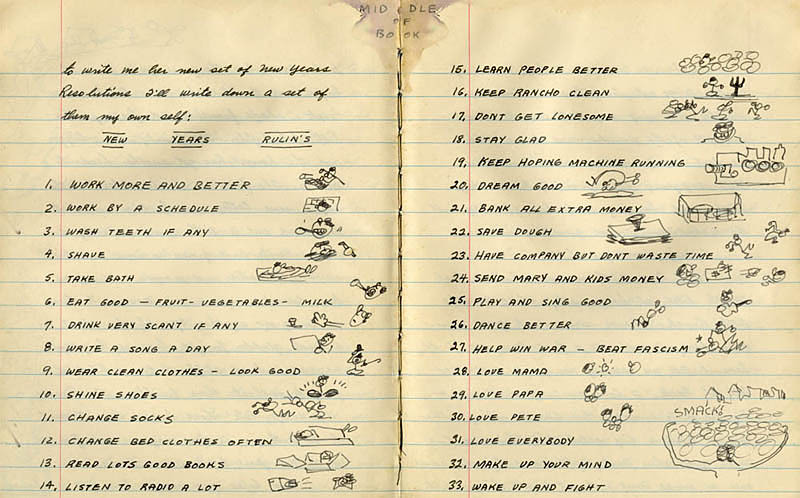 In January, I posted my “rulin’s” for the year, just as Woody Guthrie once did. We are getting close to a point where a pass/fail can be declared, but two months offers opportunity to at least pay attention to some of these things and perhaps sprint towards success. So today, I am looking back at my intentions, recognizing those successes, and looking forward to what I might be able to salvage. 1. Finish writing my book. This is going to be the year. Oh, what a sweet, optimistic thing I was back in January! Nope, not going to happen. But, I am really pleased with some of the progress that I made, advice I have been given, and even some new connections that I have made. I am hopeful that I am on a roll and that I will use my wonderful pool of advocates to maintain the push on me to get this done. 2. I am going to drink more water. There, I said it. I kind of think that I have done pretty well on this. I bought a new water bottle for work that I drain once a day. If not always successful, I am certainly more consistent. 3. My gym membership will be used more. I actually had some great momentum going at one time last year. I need to figure out how to gain that back. Bad news on this one. I had the classic great run at the beginning of the year, but I have petered out terribly. Good news, I found my way back to the gym this week. 4. I will watch less television. Dan and I discussed last night that we would do at least one night a week television free. We have not had a regular television free night, but it does happen. What I will say on this is that I have refused to pick up new television shows this year. I have my shows that get recorded and that we stay current on. What I tend to do, however, is turn on the television at night, just because. I am pretty sure that I can do better at this! 5. I am going to learn how to dance – my Christmas present from Dan. We did this! We took our dance lessons and had fun doing it. Dancing – with any kind of expertise – takes practice. We have not done a good job at that, but there are still sixty-one days to make that better! 6. I am going to fit into some of those clothes that I refuse to move out of my closet. 7. I am going to spend time each morning at work, planning my day. When I do this, I am so grateful. I have tried different versions of planning tools this year. I found these wonderful composition books that I keep as a runner. One is for work, and one is for outside work. My work book has a weekly to-do list that I add to during the week and then transfer undone things to the new week. This has worked pretty well, as has using Wunderlist for master list keeping. I can definitely step up my game on this, but I judge this a partial success. 8. I am going to clean my office at work and keep it organized and inviting. Again, partial success. It looks like 2014 will see the opportunity to finally move out of our temporary trailer home and into a real building with most of the rest of our department. I am so eager for that to happen. In the meantime, my office continues to be a pretty nice location. I have a great view of the city skyline and I have embellished by walls with fun and colorful posters. Most recently, I strung ribbon near the ceiling and hung pretty postcards from the ribbon using fancy paperclips. Just walking into my office and seeing some of those images makes for a better experience. I am kind of psyched to decorate a new place! 9. I am going to re-up my Mug Club membership because going to lunch at 75th Street every Sunday with Dan is one of the things that makes me happiest. Perhaps the easiest thing on my list. Done. 10. I am going to learn how to draw Ali’s dog Banjo better so I can write stories about her. I’ve worked on this, but I need to get back at it. I haven’t nailed her cuteness yet. 11. I am going to send fan mail (real postage stamped mail) once a week to someone I admire. I did this a couple years ago where I sent notes to authors of books I read. It was heartwarming how many wrote back and told me how much my note meant. I am doing this somewhat. Hillary Clinton and Joe Biden got mail from Missouri, as did some authors. This is fun and I want to do better on. And I have some great postcards! 12. I will do what I can to make the possibility of us opening a brewpub one day a reality. While I haven’t done a whole lot on this front, there have been some great conversations about this and potential for exciting things to be happening in the coming year. 13. I will be a better leader and employee by being more positive and creative. One thing that I have tried to be this year is a transparent leader. I share what I know almost always. I am honest in my conversations and try to acknowledge when I am wrong and when I just don’t know the answer. I try to laugh and project a positive attitude. I am partnering with a co-worker in initiating some personal development activities for our co-workers. One of them is to show a couple TED talks over the noon hour. We had our first one recently and it went well. This week we start our SEVEN HABITS IN EIGHT MONTHS discussion group. I think that I have done okay on #13. 14. I want to video chat more with Sam and Ali. We haven’t done this a lot, but we have done it more than we had. I like it very much! 15. Books – love them. I don’t really have to put it on my list because I will always read them, but I do want to read more! Good lord, there are so many wonderful books. Just yesterday, I got one in the mail that I had to order because Sam wrote me an email about how good it is. My list will probably be shorter than last year, but I have had some winners this year. That book that Sam recommended was John Greene’s THE FAULT IN OUR STARS which is a beautiful book about two adolescents falling in love while dealing with their own mortality. I just finished BILLY LYNN’s LONG HALFTIME WALK about Iraqi soldiers being “honored” at a Dallas Cowboys game. Excellent. 16. Magazine – love them too! I have not done a good job keeping up with the wonderful print magazines that come into our house each month. I will do better. 17. Computer – love my computer too, but I spend too much time with it and not enough time with rulin #15 and #16. Have not done well at this at all. Sixty-one days to do better! 18. Last year I bought the Hugh Acheson cook book and that became my adventure cook book for the year. I didn’t do great with it, but I did okay. I got Girl and Her Pig for Christmas this year. That’s my rulin there. Miserable failure on this. I have not cooked anything from this delightful book. This will happen. 19. The Italy documentation will be completed. I haven’t updated on this, I know, but I will. I am actually doing okay, but I need it on the list to keep me moving. While I am not finished, the beautiful album that we brought back is complete, other than some captions. It makes me so happy when I pick it up and move through the page. I have to decide what to do with the left-over photos and other momentos that we brought back. I thought at one time to do an album just of the meals we ate. That may still be an option. Just writing this makes me want to gather everything and look at it. Oh Italy – what a dream come true! 20. Be a better gardener. I planted basil last summer and did not make a single jar of pesto. I think one thing that I need to do is figure out a good watering system. Not for lack of trying, I had a horrible year for basil. I planted it three times and only towards the end of summer did I really have any plants. I think it may have been a soil issue. The marigold seeds that I thought I planted turned out to be pot marigolds that were very different from my beloved marigolds. They were pretty, but not what I want. Successes were lettuce that was used in salads, lemongrass that was delicious in a few meals, and I have a great stand of chives. 21. Keep a journal better. Those fun composition books have really worked here. I keep a weekly running page that I have been photographing and using as the header for my “Good Things” post. I also have been writing pretty regularly in my 5-year daily diary. 22. Do the crossword puzzle every day. It keeps your brain fresh! Not too bad here. One of the things that I do at work is copy off the daily NYT crossword and put it in the kitchen for people to fill in while they are heating up their lunch. I keep a copy for myself. I don’t always get to it, but pretty often. 23. See my friends more, and be better about setting up times. I will never be perfect at this, but I think I have done okay here. Always can do better. 24. More movies. This is one of those things that I really do think that if I put it down, it will make me go see more movies than if I didn’t. Sixty-one days to see some of those movies that I really want to see. I need to prepare for Oscar! Not great, but not horrible here. We saw some great shows this year. Sallie Ford playing with Thao and the Get Down Stay Downs was super fun. Jim and Micaela getting in the photobooth with Sallie continues to make me laugh. I got to see my man, Jason Isbell and the super delightful, They Might be Giants. We went to hear wonderful Bob Walkenhorst a couple times (should go more), and music at BB’s Lawnside. Already have tickets to see solo Jeff Tweedy next month. 26. Keep up with my Newbery Challenge. This is my gym reading. When gyming goes by the wayside, so does Newbery. Two months to pick it up. 27. Pick two music albums each month that I really get to know. I would say that I have done okay on this. I have tried to highlight some albums on my blog that I do get to know. One of the things that I have done lately is to email the artists to tell them that I have done that. It has been sweet to see how many email me back to thank me and tell me that they like my blog. 28. Make a photo album of 100 pictures from 2012, and put the 100 photos from 2011 that I ordered last year into an album. Success. Again, I need to add some words. 30. Figure out how to start an Etsy shop. We have some ideas that we have been kicking around and doing some stuff on. Time to get real. 31. Get the attic organized. I made such progress when we got to fill the dumpster, time to make it right. There are sixty-one days in which I can make good on this. 32. Bring my guitar out of hiding and play it again. It is out of hiding and I pick it up every now and then. I think I need to restart lessons. That can be a whole new rulin in 2014. 33. Keep Deliberate Obfuscation active and fun for me. This has definitely been a success. It is weird how fulfilling it is to check my stats and see that people are actually reading. The 304 days that happened before today have been almost all good for me. I have high hopes for the remaining days of this year, and I am already getting excited about some rulins for 2014. Who else is doing some reflecting as we hit this countdown of the last days of this year? Like Hemingway, I think writing is a letter is a swell thing. Although my format these days is most often a note rather than a letter, I think it still counts. Taking the time to put words down on paper reflects something more. I have grappled with how to write about this without sounding like I am praising myself for taking time to write notes. The truth is that one of the reasons that I love to write notes is that I love to buy notecards. I grapple constantly with a major stationery jones. I see pretty cards, fun envelopes, beautiful paper – I want them. When Chronicle Books sends me an email about a “percentage off!” and “free shipping!”, I believe that it is being spend-thrifty to go and buy a box or two of cards that I have had my eye on. Otherwise, I might see them full price somewhere and cave in to their allure. Well stocked with wonderful receptacles for notes, I need to produce so I can justify getting some more. I am sentimental about such things too. I have envelopes from the hotel where we went on our honeymoon. I once used one to send Dan a Valentine’s Day note, but I still have one left in my stash. I have awesome thin envelopes with pictures on them that we got while we were in Bolivia. Some cards that I buy, I like so much that I keep them for my own pleasure. They are like mini art pieces. Some I frame. Some I tape up on a door or wall. In my office at work, I have strung ribbons along my walls and I hang cards from them with paperclips. It is a happy look. Correspondence that I receive are similarly sentimental. Several years ago, I was going through my postcard collection that I had when I was a kid and I came across postcards that my mom and my grandma had written to me. When I found them, both my mom and grandma had been dead for several years. Seeing their writing meant much to me, and I continue to treasure those finds. I have all of the letters that Dan and I exchanged during college when we were apart during summers and his term abroad. At the time there was no email and we were too poor to pay the long distance call rates. On many of the envelopes, he wrote a little note to Howard, the postmaster in my small town. Howard came to our wedding and laughed at how much he enjoyed those notes. I have a big box full of birthday cards, thank you notes, and miscellaneous correspondence. Naturally, I have everything Sam and Ali have written to me. I am a packrat, but I try to be tidy about it. If I send a note in the mail, my hope is that it brings the receiver a small amount of happiness, or warmth, or comfort, or pride. If I leave a card or note for a co-worker, I hope that it helps them understand what they mean to me and our organization. It is an easy gesture that can bring with it much more than the effort that it took to produce it. Like Hemingway, when I have finished a note, I do feel like I have done something.